There is this bot on Twitter that creates a blogpost out of twitter threads. The bot functions more or less like this: someone writes a thread, a reader responds to one of the tweets invoking the bot’s name, the bot then automatically creates a blogpost that is posted on the bot’s website (with attribution to the author that wrote the thread in the first place). I have blocked this (and similar bots). Someone might argue that I am being unreasonable and the bot is just a public service for people who prefer to read in a more streamlined format. This is probably true. However, the bot reproduces extractivist practices that I have argued before, continue a pattern of resource accumulation. In this particular case the resource accumulation is not merely data (like you would see in the databases that were created by say, Cambridge Analytica) but also intellectual production (ie the writers whose work is non consensually removed from the context in which it was produced and indexed by a third party that might one day run adds for profit). Here I have to go back to my points from a previous post about the lack of “personal space” in regards to social media. If something is published on social media, it is assumed to be republishable. Of course copyright laws still apply but consent is not deemed necessary to republish tweets or facebook posts in their entirety, completely removed from the context in which they were created. For this purpose, platforms have created a feature where publishers can “embed” a post or tweet elsewhere (this is, by the way, not the same mechanism through which the bot described above republishes content which is, arguably, even more invasive). Consent from the authors of these posts is neither required nor requested. Buzzfeed, with its listicles made entirely out of tweets, has even turned this practice into a business model. What I find interesting in this situation is that for years we’ve heard that social media is an extension of the self. As in: on social media we “are”. Not only “the body as data” in the sense of our geolocation, number of steps we walked or blood pressure metrics but our wants, needs, desires, social exchanges, etc. In that sense, social media operates like an extension of the self. At least, the self we choose to share with others. But this self, by merely existing in these platforms, is not afforded the rules of consent that are reserved for our physical bodies. While we cannot be non consensually “relocated” in the physical world, our “projected self” can be grabbed and relocated elsewhere by the mere act of “existing on social media”. Not only that, but these “indexed selves” can be turned into profit for someone else (see: Buzzfeed listicles comprised of people’s tweets). In classic colonialism, the object is to exploit not only natural resources but also human resources. Native inhabitants represent a cheap labor source that can be harnessed to produce goods and extract materials for export to the metropole. They also serve as consumers, expanding the market for goods produced by the metropole and its other colonies. Goods and raw materials, like colonists, follow a circular path in classic colonialism. 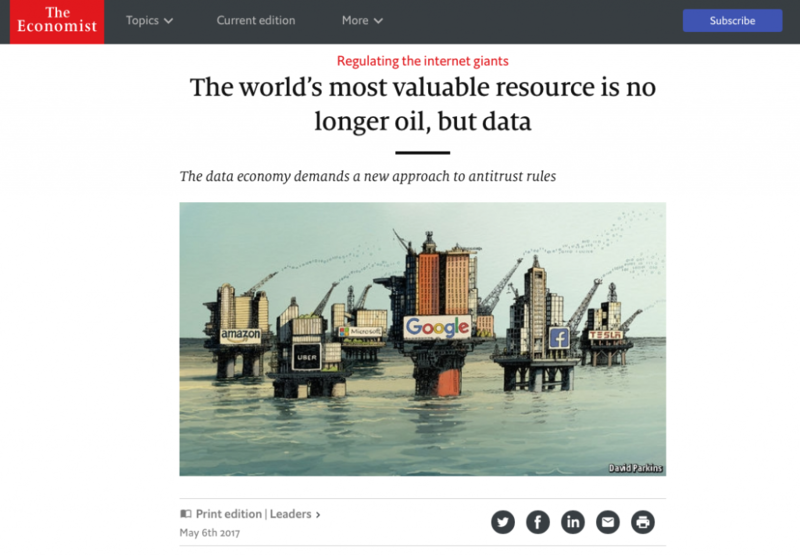 The article went on to argue about the need to create legal frameworks to regulate internet giants such as Facebook, Google or Amazon. However, what caught my eye is that it was one of the first times I had seen such a mainstream publication (and especially one directed at a specific demographic) acknowledge data as a commodity, a resource. I have argued before about the coloniality of the algorithm (ie the way technology perpetuates colonial practices of resource accumulation and the foundational moment of capitalism as a system based on taxonomies and hierarchies designed to maintain control of resource accumulation). In this coloniality, non consent remains a necessary feature, an underpinning that sustains these practices through time. Permission is not needed to republish content elsewhere, regardless of how the content producer feels about this practice. “The Public” (as in “the platforms where this content is published”) is conceived as a space up for grabs, to monetise or repurpose without securing consent first. The bots that index our social media selves will just continue reproducing an all too human behaviour.